Tired of endless pitching to investors? Need to close your funding faster? The calendar shows our Members angel group meeting dates so entrepreneurs can more easily plan their funding raising activities. One of the main goals of InSync is to provide start-ups efficient access to multiple angel groups. Our network has developed processes for syndicating and sharing deals. We are continually expanding our Network to create greater deal flow and investment capacity. 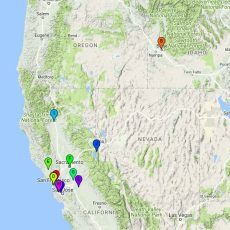 Members groups are in Northern California and the Sierras and share deals via our GUST and/or ProSeeder platforms. ENTREPRENEURS! Want to Get the Network Interested in your Deal? Apply to any of our Member Angel groups and get them interested so they are motivated to share your deal within the rest of the InSync Network via our GUST and ProSeeder platforms. InSync itself is not a funding group; you need a Network member to sponsor you. Click the link below to get more information and see how best to get your company profile on the deal platforms. Angel Groups! Would you like to join us? If you are on the West Coast and interested in our network, consider joining us in our mission to improve Angel group deal flow and making it easier and faster for entrepreneurs to get funded by us. Just contact us by using the link below.